I needed something to do over the holidays that didn't involve my sewing machine. I spent an evening looking for an easy embroidery pattern to try. 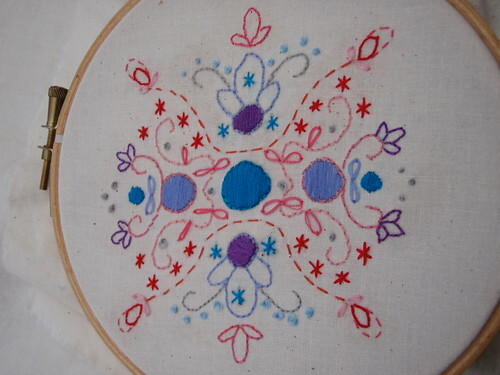 My embroidery skills are a bit more than limited! Not quite a pattern of fire but I like it. Clearly I chose well as the designer is also co-author of &Stitches. I couldn't resist and have bought the first issue which is really interesting, especially the section on colour selection! Now that I can't confuse myself (don't look at the random red/orange I've put in) and have finished the embroidery I will be giving that a read!